Calories burned (Kcal). On a normal 24 hour day without exercise I probably do around 5000 steps. The watch GT logs only around 100 calories burned. Surely this is incorrect? Fitbit & Garmin would usually register 2000 calories or so burned in a same time period. Huawei Health is usually displaying a few calories over or under compared to the watch itself. Currently the watch is displaying 10 cals over what the app is displaying. GT Watch is showing moderate intensity exercise on the display, Huawei Health is not logging this information whatsoever, even on days with a run or exercise. "Today Card" doesn't always sync when swiping down to refresh. At the time of writing this, my heart rate graph for today on Huawei Health hasn't updated since 10.34am and it is now 1.46pm. It's annoying to have Huawei Health integrating phone pedometer with watch pedometer. My Samsung Galaxy S9+ over counts steps, so i wan't the ability to choose the GT watch as the only source. These are some really fundamental issues that need to be fixed. The Watch GT hardware itself is fantastic and i believe that the HR monitor is more accurate than the Garmin Vivoactive 3 that I previously owned. If Huawei want to seriously compete with Garmin and Fitbit in the fitness tracking sector, then they need to sort out their Health app integration. It might be early days for the GT but from what I'm experiencing, it needs some software polish to bring it up to a competitive level. Hello, how did you get the watch as I don't believe it's released yet in the UK? It was available on Amazon. I purchased mine at Very.co.uk, they have stock in the UK. Odd as very don't list the huawei gt watch and Amazon has it still on pre-order. Are you sure you don't have the huawei watch 2? The software won't be updated to the GT as it's not official released yet in the UK. 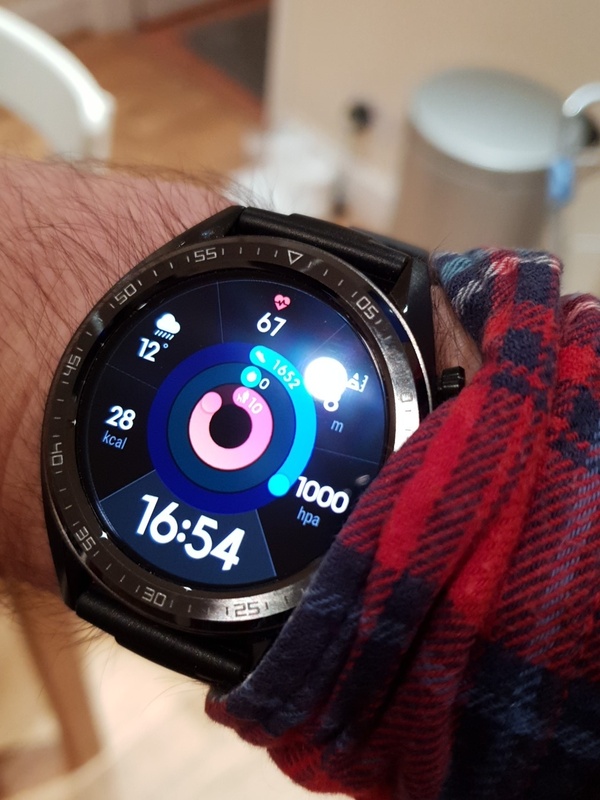 With other devices you have to connect it to huawei health app and then link that to Google fit. my watch shows 3 mile walked witth 1786 calories burned in 6924 steps, yet health app shows 7700 steps, 3.3 mile but only 387 calories burned. I have a Samsung S9+. I don't use S Health or Google Fit. Only Huawei Health. Am I better off using Google Fit or another 3rd party fitness app? I'm not sure with the s9 but yes you'll need to connect both hiawei app with Google fit. As I've said Huawei app is not linking properly to Google Fit, it's not the only app with this issue, other apps have same problem since Google changed the app to the new style. I've just woken up this morning and found that weather reports are now not showing on the watch, despite them being enabled in the Huawei Health. I've emailed Huawei about these bugs, so hopefully they get resolved as they release more watches. Just hope they do better updates than they do on W1 and W2, as Huawei aren't known to be reliable with updates. Doesn't fill me with much hope. However I know someone in the UK who's had the Watch GT longer than me and he has said that there's been about 3 updates in about a month. So fingers crossed! I can't really help further as the device is not officially released in the UK, I know the device is running its own Huawei OS and As your not using a Huawei mobile phone Incamt offer direction. As an owner of the device in another thread you said it can't make or recover calls again this isn't what is advertised or demoed so I think you have the device without latest software, again possibly due to pre sale. I haven't read anywhere that states that the Watch GT can make calls. In the online help section for the watch, there is no mention of making calls, only the ability to reject calls through notifications. Someone on Amazon has also asked the question if the phone can make calls and the Huawei support team quotes "The Huawei Watch GT will notify you when you're receiving calls or messages and you can refuse calls. The watch cannot be used for calling, speaking in calls or sending SMS messages". So I think you're misunderstood I'm afraid. Aw damn that makes no sense for them I'm a set watch 1 user and it can make calls not that I would but I can reject calls or pickup at least from the watch. I think I need to test one first before I make the Leap. This must be their own OS then for sure..
You have to bear in mind that the Watch GT is a fitness tracker only. If you're looking for a smart watch, then look somewhere else. I'm into my fitness and have owned Garmins and FitBits. The Watch GT does a great job of tracking exercise, sleep and HR. I'm pleased with how it performs on that level, there's just few bugs that are preventing it from being polished. I'm hoping that LiteOS is going to be the future of Huawei wareables and therefore they are going to spend more time on developing it. The H1 and H2 are a Google platform and Huawei are probably more restricted. That's why they have opted to go with LiteOS for the GT. Sounds like you might have a faulty unit as my heart rate monitor and step count works perfectly, it's just the syncing with the app that's the issue. I have tattoos down both my arms so I'm thinking this could be an issue with the heart rate monitor maybe? Depending on the ink type used in the tattoos they may indeed interfere with the heart rate monitor. Some tattoo inks do contain metallic particles and these will stop the sensor from getting a accurate measurement. Got my watch GT today, and it doesn't seem to be registering my steps well. It registered a few during initial setup and a couple of updates. once it was ready i walked about a bit and no increase. It seems that when I get a notification from something that it updates the count a bit. What was really odd when I got a call my step count suddenly jumped up lots and also but aslo counting while I was walking and talking. It continued counting a short while after but has reverted to not registering many steps. Hi Goldie, the Watch GT is designed to not overcount steps. Therefore it will only register steps after you make about 10 meaningful steps. This design means that you won't get credited for a step when you move your arm or brush your teeth. That kind of thing. When you do make 10 steps it will suddenly jump up 10 or so and then carry on counting if you're making more. I've noticed that I haven't been getting steps registered when I move from one side of my kitchen to the other which is about 5 steps. This might be what you're experiencing? Maybe it is I'll count some steps and see when it starts registering. The bit that got me the most was the sudden jump from 199 registered steps to over 400 when I got a call. I had been walking around the house went for a shower (no change) then got the call and wife was asking me about my new toy. I was about to say its not registering them when I saw it was now over 400 and continued to rise in real time. Shortly after the call it stopped counting again but I may have stopped walking as I was getting dressed. It sort of suggested that it only updated the count when it got a notification or interaction from my phone. Other possible options, increased heat or moisture from the shower affected the count rate. I did take it off to dry it and my wrist before the call so maybe it was that.